"Inflation Control: Do Central Bankers Have It Right?" and/or the accompanying slides from a presentation for the Australasian Macroeconomics Society in Canberra, August 2017. The paper gathers together informal stuff I have written on so-called Neo-Fisherism and monetary policy. So, the Bank tells us that inflation is currently below its 2% target, but is expected to come back to target as "excess capacity" goes away - basically a PC mechanism. In the old days, Lucas developed a theory of the Phillips curve, the upshot being that, as emphasized in the Lucas critique paper, policymakers should not be using observed PC relationships to guide policy, as such relationships are not structural. Indeed, the theory tells us that PC correlations could be positive or negative, and the slope of the PC curve depends on the policy regime in place. In more recent times, PC theory re-emerged in the New Keynesian (NK literature), but if we take NK models seriously, they give us more reasons to doubt the invariance of PC parameters to changes in policy rules (e.g. wage and price setting should change with policy). ...what is troubling is five straight years in which inflation fell short of our target despite a sharp improvement in resource utilization. 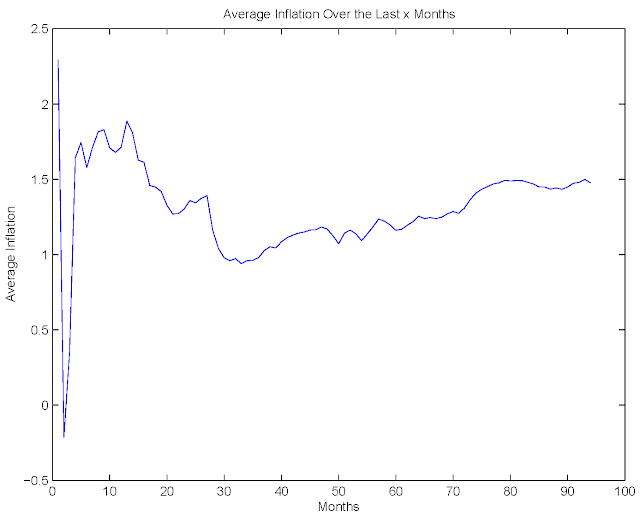 In this chart, you can see a noticable recent reduction in inflation. Year-over-year, the inflation rate is 1.4%, and the average inflation rate since the beginning of 2017 is about zero. 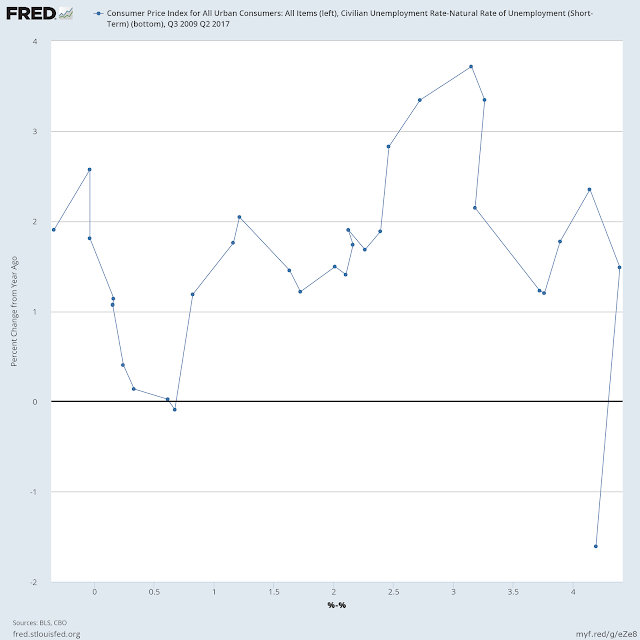 Consistent with what Brainard says, it appears the labor market is unusually tight. The unemployment rate is 4.4%, and the CBO claims that the natural rate of unemployment is 4.7%. If you really believe in PCs, that might make you think. Brainard says this is "troubling," which I guess means that the PC is in trouble, policymakers are in trouble, we are all in trouble, or some convex combination of the three. In many of the models economists use to analyze inflation, a key feature is "underlying," or trend, inflation, which is believed to anchor the rate of inflation over a fairly long horizon. Underlying inflation can be thought of as the slow-moving trend that exerts a strong pull on wage and price setting and is often viewed as related to some notion of longer-run inflation expectations. This makes is sound like this "underlying inflation" thing resides in most of the models that macroeconomists work with. While some (most?) undergraduates are taught some version of IS/LM/PC with exogenous inflation expectations, no monetary economist I know tries to analyze inflation in a model with exogenous "underlying or trend" inflation. And that's certainly not a feature of typical NK models, except versions with sticky expectations. But trend inflation is indeed a variable in the Board's FRB/US model, if you have the patience to wade through the documentation. Indeed, essentially everything important in FRB/US (real GDP for example) ultimately reverts to some exogenous trend. Board governors and Board economists have certainly been known to treat FRB/US very seriously, so it's not surprising that Brainard is like-minded. The most recent observation is about 1.8%, which is certainly lower than the 2.2%-2.7% we typically observed before the financial crisis, but 1.8% is not all that low. Accounting for the fact that TIPS are indexed to the CPI (rather than the PCE), and adjusting for risk and other factors, this might perhaps translate to an anticipated PCE inflation rate of 1.5% or thereabouts for the next 10 years. If people are actually anticipating 1.5% inflation, that would seem to call for a modest adjustment of some sort in monetary policy, as the clear intent of the Fed is that people should anticipate 2% inflation forever, and be pretty sure about it. But what sort of policy adjustment are we talking about? Is inflation too low because the Fed has been doing a bad job? Brainard says no. According to her, the problem is that the Fed has been constrained. [An] explanation may be the greater proximity of the federal funds rate to its effective lower bound due to a lower neutral rate of interest. By constraining the amount of policy space available to offset adverse developments using our more effective conventional tools, the low neutral rate could increase the likely frequency of periods of below-trend inflation. In short, frequent or extended periods of low inflation run the risk of pulling down private-sector inflation expectations. (1) R = r* + i* + a(i - i*) + b(y - y*). In equation (1), R is the central bank's nominal interest rate target, r* is the long-run real rate of interest (supposing this is a well-defined object), i* is the central bank's inflation target, y is some measure of aggregate economic activity, and y* is "potential" economic activity (assuming, again, that this is well-defined). According to the Taylor principle, a is a parameter larger than 1, and typically b is a positive parameter. Then, r* + i* is the neutral rate of interest - the central bank's nominal interest rate target when it is achieving all of its goals. So, given the Fed's inflation target of 2%, if r* is lower, as is consistent with what we can see in the last chart, this means that the neutral rate of interest is also lower. If r* is low, we should observe a low nominal interest rate target, on average, with the Fed responding to random shocks and missing its ultimate inflation and output targets on the low and high sides. But, what's a good estimate of r*? For this we need a model. In standard neoclassical growth models with some sort of appended role for monetary exchange, r* is a constant, and in some models it's endogenous, and dependent on monetary policy, among other things. Certainly, if we want to explain what is going on in the last chart, we can't rely on a theory that implies constant r*. But whatever is driving r*, (a shortage of safe assets for example), we can certainly agree that r* is low. If it's as low as what we see in the last chart, post-recession, then r* = -1.2%, and the fed funds rate is currently well above where it should be. If r* = 0, say, then the current fed funds rate, at about 1.2%, is only 80 basis points below what Brainard would consider neutral. That's certainly not the way the majority of the FOMC thinks about this problem, as you can see from the last submitted projections. Most committee members think the fed funds rate will be above 2% by the end of 2018, and about 3% in the long run. Of course, the FOMC's actual policy interest rate has come in well below its forecasts for some time, and whether the FOMC now knows its own mind remains to be seen. Thus, if the low inflation readings we have seen this year turn out to be transitory, and the FOMC finds reasons, as it has in the past, to forego interest rate increases, things should be just fine (barring some unforeseen disaster, in which case inflation control is out the window anyway). That's basically PC logic. According to the Committee, inflation may be low, but "accommodative" monetary policy will further tighten the labor market and, through a Phillips curve mechanism, make inflation come back to 2%. Why should the Fed continue to raise its nominal interest rate target? According to the Committee, that's preventative medicine. Tightening needs to occur in order to ward off excessive inflation, according to the majority of FOMC members, apparently. Brainard appears to be disagreeing with that view. According to her, the Phillips curve mechanism is inoperative. But what is she recommending? If, as many forecasters assume, the current shortfall of inflation from our 2 percent objective indeed proves transitory, further gradual increases in the federal funds rate would be warranted, perhaps along the lines of the median projection from the most recent SEP. But, as I noted earlier, I am concerned that the recent low readings for inflation may be driven by depressed underlying inflation, which would imply a more persistent shortfall in inflation from our objective. In that case, it would be prudent to raise the federal funds rate more gradually. Basically, Brainard wants to see the inflation before increases in the policy rate occur. If inflation comes up, then she's in agreement with the rest of the committee. If if it doesn't come up, she would rather not have interest rate hikes. But, if the PC is inoperative, how will low nominal interest rates make inflation go up? How do low nominal interest rates cure the problem of "depressed underlying inflation" that she thinks exists? Brainard suffers from Phillips curve confusion, and so does the rest of the FOMC, though in each case it's a different form of the disease. As I summarize in my recent paper, central bankers generally have inflation control wrong. Mainstream macroeconomic theory tells us that a central bank that raises its nominal interest rate target permanently raises the inflation rate - in the short run and in the long run. These models also tell us that a central banker armed with a Taylor rule and following the Taylor principle inevitably falls into a pit of frustration featuring low nominal interest rates and low inflation. That's in accord with the empirical evidence - with adjustments for factors other than monetary policy that matter for inflation and real interest rates. But central bankers aren't really interested in mainstream macroeconomic theory - for some reason they prefer to be led astray by undergraduate IS/LM/PC models. Why? Beats me. Ben Bernanke has written a couple of blog posts on the zero lower bound (ZLB) on nominal interest rates, and some implications for monetary policy going forward. The first deals with the extent of the ZLB "problem," and the second with monetary policy solutions. In a previous post I wrote about the low-real-interest-rate phenomenon, and how central bankers view the implications for monetary policy. Basically, the real rate of return on government debt in the United States, and around the world, has been persistently low because of low productivity growth, demographic factors, and - most importantly, I think - the high demand and low supply of safe and liquid assets. In his first piece, Bernanke is primarily interested in a paper written at the Federal Reserve Board by Kiley and Roberts, which I also commented on in my earlier post. Kiley and Roberts determine, based on simulations of the Board's FRB/US model, that if low real interest rates persist into the future, then US monetary policy will more frequently be constrained by the zero lower bound - assuming that negative nominal interest rates are not an option. The consequences, according to Kiley and Roberts, are that inflation will tend to fall short, on average, of the 2% inflation target, and - by Phillips curve logic - real output will fall short of "full employment" output. As you can see, the difference is on average positive, and quite variable. But, if the 10-year breakeven rate is biased upward as a measure of anticipated inflation, then maybe anticipated inflation is in fact substantially lower than 2%. So maybe Bernanke shouldn't be so puzzled. But suppose that we take other measures of anticipated inflation seriously, as Bernanke does (and perhaps as we should not). For example, professional forecasters, rightly or wrongly, tend to persistently forecast 2% inflation over the medium term. Bernanke's interpretation is that Kiley and Roberts are doing the analysis right, but they're not taking into account other aspects of policy - forward guidance and quantitative easing (QE). That is, according to Bernanke, the Fed will "do what it takes" to maintain its 2% inflation target in the future - binding ZLB or not. One possibility, which seems desirable in any case, is just to build on and improve the approaches used between 2008 and 2015. Strategies the Fed used to address the zero lower bound included aggressive rate-cutting early on, quantitative easing, forward guidance about future rate paths, and a “risk-management” strategy that entails a very cautious liftoff from the zero bound when the time comes. According to the Fisher equation, higher average inflation would imply a higher average value of nominal interest rates, and so the ELB would be encountered less frequently. But they don't seem to understand that a corollary is that, if the ELB (effective lower bound) is encountered more frequently, this implies that the nominal interest rate is on average higher than what is required to hit the 2% inflation target. So, "according to the Fisher equation," as they say, inflation will be higher, on average, than 2%, not lower. I've written a paper about this. My model can accommodate a number of things - sticky prices, money, credit, open market operations, collateral, safe asset shortages. And it's got neo-Fisherian properties, as all mainstream macroeconomic models do. In the model, one can work out optimal monetary policy, and I do this in the context of different frictions, to separate out how these frictions matter for policy. With just a basic sticky price friction, the model exhibits a Phillips curve, and if the ZLB binds in the optimal monetary policy problem, due to a low real interest rate, then inflation and output are too high. If we take this version of the model seriously, an interpretation in terms of recent history, is that low real interest rates have not been impinging on monetary policy in the United States. Inflation has persistently come in below the 2% target, and the Fed was doing the right thing in raising nominal interest rates, so as to increase inflation. 2. If forward guidance works, it does so through commitment to higher future inflation. And this promise is carried out with a higher future nominal interest rate. Again, this is just standard neo-Fisherian logic. The current nominal interest rate determines anticipated future inflation. So, if the problem is a binding ZLB constraint, and current inflation is too high as long as the ZLB binds, then the central bank can reduce current inflation while at the ZLB by promising higher inflation when the ZLB no longer binds. But, according to the Fisher effect, the central bank achieves higher inflation through a higher setting for the nominal interest rate. That's in my paper too. Conventional ZLB economics doesn't work that way. Work by Eggertsson and Woodford and Werning derives results that Bernanke describes as "make-up" policy. That is, the central bank makes up for a period during which the ZLB binds by committing to staying at the ZLB for longer than it othwerwise would. As far as I can make out, these results are particular to how these authors set up the problem. I can turn the results on their head in a model with sticky prices, demand-determined output, and a Phillips curve. And I can do it in a way that doesn't yield various "paradoxes" - a paradox such as less price stickiness being a bad thing (Werning). But that's forward guidance in theory. I have yet to see forward guidance work in practice. Indeed, Bernanke's execution of forward guidance in the post-financial crisis period is an example of how not to do it. 3. Quantitative easing as an approach to inflation control? Forget it. A great example here is Japan, which I most recently discussed in this post. QE appears to be ineffective in pushing up inflation in a low-nominal-interest-rate environment - the solution if inflation is too low is what comes naturally: increase the nominal interest rate. In conclusion, if low real interest rates persist, at the levels we have seen, then this should not be a problem for inflation control. The Fed can control inflation, albeit with a lower average level of short-term nominal interest rates than we have seen in the past. Potentially, problems could be encountered, not with inflation control, but in affecting real economic activity. Though neo-Fisherism says increases in the central bank's nominal interest rate target make inflation go up, these ideas do not suggest that an increase in the nominal rate makes output go up. The conventional notion that monetary stabilization policy is about reducing interest rates in the face of shocks that make output go down seems to be strongly supported by the data. Thus, if there is a problem for monetary policy in a low-real-interest-rate environment, it's that the nominal interest rate cannot fall enough in the face of a recession. Between mid-2007 and late 2008, the fed funds rate target fell from 5.25% to (essentially) zero. But, if the average fed funds rate is 3%, or 2%, it can't fall by 500 basis points or more in the event of a downturn. But how do we know that historical Fed behavior was optimal, or even close to it? Standard New Keynesian theory says that, if the real interest rate is sufficiently low, then the nominal interest rate should go to zero. But in my paper, if we're explicit about the reasons for the low real interest rate - in this case a tight collateral constraint - then the low real interest rate implies that the nominal interest rate should go up. That is, a low real interest rate reflects an inefficiently low supply of safe collateral, and an open market sale by the central bank can mitigate the collateral shortage, which results in higher nominal and real interest rates.